We are very happy that you have found our company. Because, in finding our company and using our products, we know that you and your family will benefit greatly from a new standard of purity, quality and eco-friendliness. Our many years of research have allowed us to set a new standard in purity and effectiveness in optimizing health and longevity. 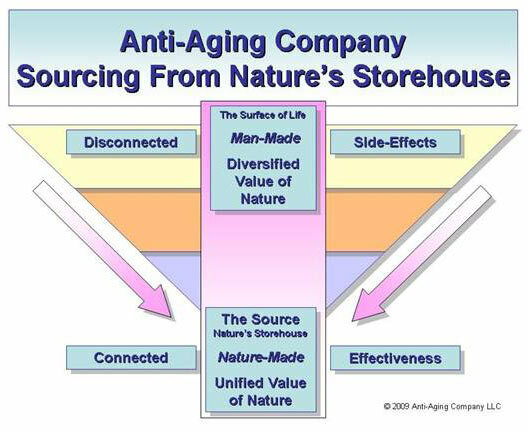 We have identified and formulated the best Anti-Aging products for our own lives. Now, we would like to share them with you and your family. THE 'LONG' STORY OF HOW WE CAME TO BE! Don't you just love the expression, When one door closes, another opens. It is comforting to know that when a challenge presents itself, we have the ability to make it into an opportunity. It is not necessary to spend a lot of time on how doors were closing in our life right and left; it is enough say that we were significantly financially challenged. Alarik was particularly feeling the weight of it. Alarik is such a great human being and he is so full of integrity and the sincere desire to make the world a better place. It was hard on my heart to see him so bogged down with financial pressures. Alarik is a UCLA-trained neuroscientist, and, in my opinion, knows more about the brain and central nervous system than anyone on the planet. He has a gift to help people understand, appreciate and utilize the infinite creative potential that is latent within the human brain. A short time after that, all kinds of healing knowledge and health formulas started coming to me. I have to tell you, it was the most amazing experience. I felt as if my brain and memory banks were a computer and files were being downloaded. The first formulas that came one at a time, were for the teeth, gums and mouth. Initially, I thought these formulas were for our family's use. But, soon our friends started using them. I remember our first customer. She is a good friend of ours. She said to me, "What are you doing for your gums? They look so healthy and my gums are having many problems. I just went to the dentist and he said that I have some severe gum recession and a loose tooth." I gave her some of our products. She called right after she used them and was so happy that she received immediate relief. After some time went by and she continued to benefit from using the products, she insisted that we come up with a price so she could pay us for them. Then, she started telling people and the news spread quickly. That is why we jokingly say, "Our business started by word-of-mouth." We do not feel we are the owner or creator of these products. We have to give the credit to Mother Nature. We feel we are just the instruments to get them out to the world so people can greatly benefit. There is a huge need for pure products straight from Mother Nature’s wealth. Products that do not harm the body but bring healthy comfort and help to establish balance and harmony. It is a great blessing in life to be able to take advantage of the great wealth in Nature’s intelligence and live more in tune with Mother Nature’s intelligence so that life can be enjoyed in health and happiness. Please know that a large portion of the profits go to help bring peace to our world family and secure a purposeful and healthy future for the millions of homeless children of the world.